Set Piccolo next to the telly or some speakers and you’ll see the lights respond to music and sound — lowest notes toward the left end of the graph, highest notes toward the right. Technically this would be called a “spectrum analyzer,” but as this is not a precision scientific instrument, we’re more comfortable labeling it a “visualizer.” It’s strictly for show. Begin by assembling the LED matrix and “backpack” board as described in the Adafruit LED Backpacks tutorial. If using the LED matrix for the first time, we very strongly recommend working through that full tutorial first. This will let you test and confirm that the Matrix is properly assembled before moving on to this more advanced project. If working with a breadboard as we show below, solder row headers on to the microphone breakout and LED matrix backpack boards (three pins on the former, four on the latter). You can optionally use 90 degree headers if you’d like either component to be positioned standing up. Connect the Arduino’s 3.3V pin both to the mic amp VCC pin and the Arduino’s AREF pin. We use one of the power rails on the breadboard to route 3.3 Volts to both locations. The AREF connection is very important — don’t overlook this! Connect the Arduino 5V pin to the LED matrix + pin. Connect Arduino GND pin to both the mic amp GND pin and the LED matrix – pin. You can use a breadboard power rail, or the Arduino has multiple GND pins available. 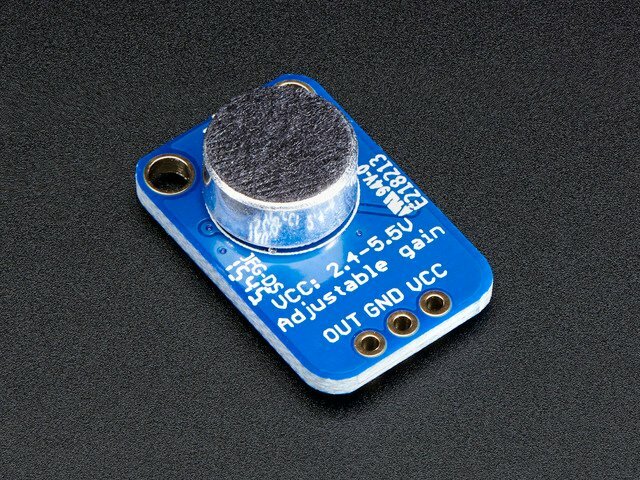 Connect Arduino analog pin 0 to the mic amp OUT pin. Connect Arduino pins SDA and SCL to the matrix backpack D (data) and C (clock) pins, respectively. Earlier Arduino boards don’t include SDA and SCL pins — instead, use analog pins 4 and 5. You can power the Arduino from the USB connection or using a battery or power supply connected to the DC jack. The LED matrix draws a couple hundred milliamps at most, so we can safely power it through the Arduino. Begin by downloading the Piccolo repository from Github. Select the “download ZIP” button. Once this is finished, uncompress the resulting ZIP file on your hard drive. There will be two folders inside: “Piccolo” should be moved to your usual Arduino sketchbook folder. “ffft” should be moved into your Arduino “Libraries” folder (inside the sketchbook folder — if it’s not there, create one). If you’re unfamiliar with installing Arduino libraries, please follow this tutorial. And never install in the Library folder adjacent to the Arduino application itself…the proper location is always a subdirectory of your home folder! If you haven’t already installed the Adafruit LED Backpack Library (for using the LED matrix), please download and install that as well. Once the folders and libraries are situated, restart the Arduino IDE, and the “Piccolo” sketch should be available from the File->Sketchbook menu. With the Piccolo sketch open, select your Arduino board type and serial port from the Tools menu. Then click the Upload button. After a moment, if all goes well, you’ll see the message “Done uploading.” The project should now be responsive to sound…try clapping your hands! Double-check all wiring against the diagrams. 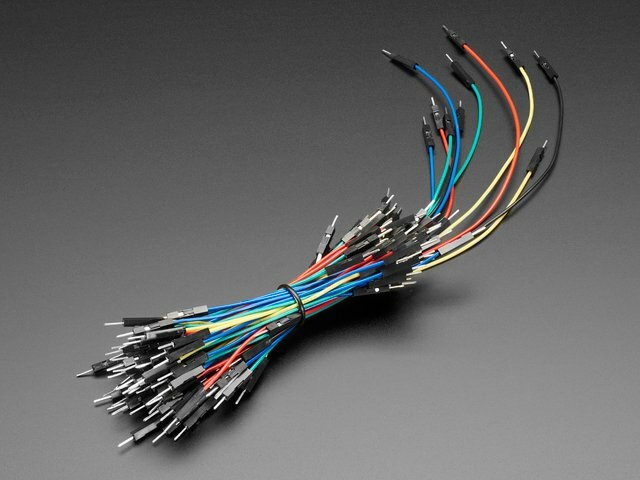 Did you include the 3.3V-to-AREF connection? D and C pins from the matrix backpack should connect to SDA and SCL on newer Arduinos, or analog pins 4 and 5 on older boards. 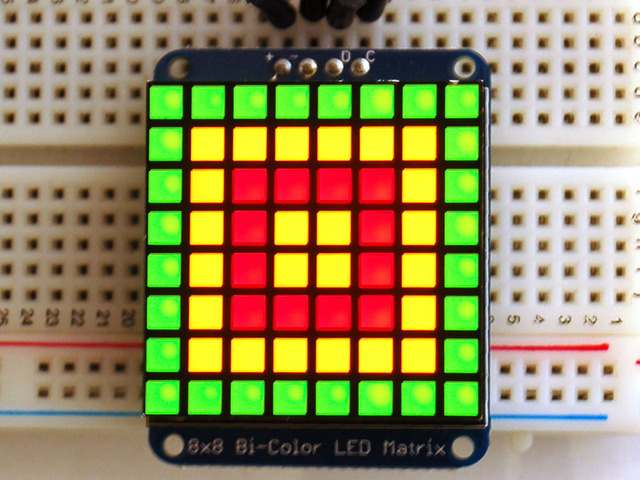 Test the matrix using the example code from the Adafruit LED Backpack Library. If there’s no response, the matrix may have been soldered to the board backwards. The gain on the mic amplifier may be set low. There’s a dial on the back of the board that can be adjusted with a small screwdriver. Using the normal Arduino analogRead() function would be much too slow for sampling audio. Instead, a feature of the microcontroller’s analog-to-digital converter called free-run mode is utilized. This automatically takes repeated analog samples at precise intervals…about 9.6 KHz for this project, the maximum a 16 MHz Arduino can handle with 10-bit samples. The raw audio samples are converted into a frequency spectrum using a fast Fourier transform or FFT. There are a number of Arduino FFT libraries out there, but we keep finding ourselves returning to the venerable ELM-ChaN ffft library for its speed and good looks. The FFT output still needs a bit of massaging to make for a good presentation on the limited 8x8 matrix. Several tables of scales and weights de-emphasize certain frequency ranges as they’re reduced to just eight columns. The software works at keeping the graph interesting, but some columns will always be less lively than others, especially comparing live speech against music of varying genres. If everything seems to stick toward one end of the graph, try another musician, musical genre, or different speakers. Depending how you choose to orient the LED matrix, the matrix.setRotation() function can be used to keep the graph upright. If you do attempt an extra-compact build like this, please keep in mind that the Arduino Micro includes a 5 Volt regulator, allowing it to be powered from a 9 Volt battery. Most small form-factor Arduino-compatible boards do not include a regulator, and will be damaged if you attempt to power them directly from 9 Volts! For such boards, either add your own regulator to the circuit, or use an appropriate battery pack: three alkaline AA or AAA cells in series, or four rechargeable NiMH cells. Additionally, the code may need adjustments for some “alternative” Arduino boards…most likely the analog channel number, which may be mapped to different pin numbers on different boards. 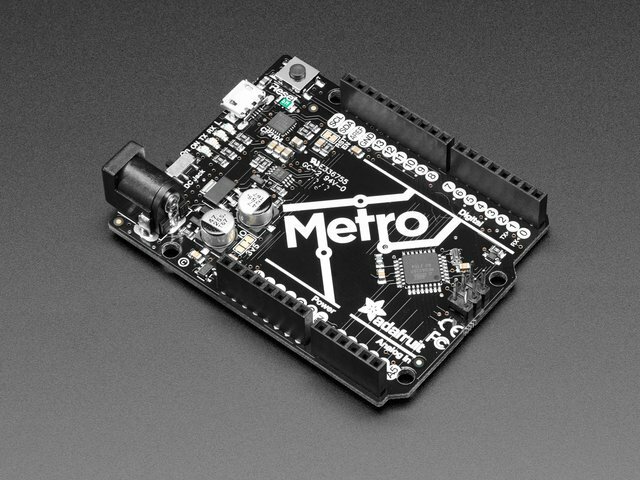 Finally, because ADC registers are accessed directly, specific interrupts are used, and the FFT code is in AVR assembly language, this software will not run on upscale boards like the Arduino Due, ChipKIT or Teensy 3.0. It is strictly for “classic” Arduinos. This guide was first published on Nov 28, 2012. It was last updated on Nov 28, 2012. Build a small meter to display voltage, current, and power usage.